Located in the south-west of the island, at the foot of Punta Carena, dominated by the lighthouse, this picturesque bay is part of a typical Mediterranean landscape. It is one of the only bays on the island where one can enjoy the sunset over the sea. The Lighthouse, built a century and a half ago, is, after Genoa, the second in Italy in terms of size and power. It is from these gardens of Augustus (Giardini di Augusto in Italian, formerly designated as Krupp gardens) that one enjoys one of the most beautiful views of Capri, with the Faraglioni in the background. 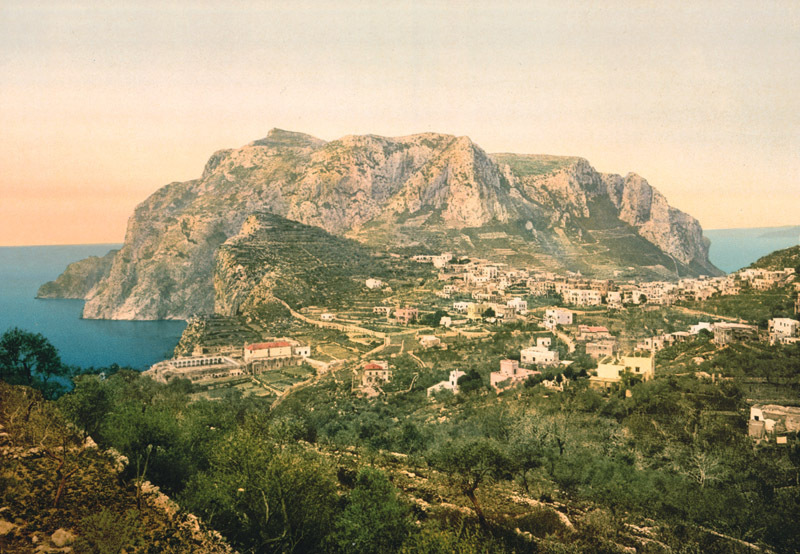 The Faraglioni of Capri are rocky peaks that emerge from the sea, southeast of the island. 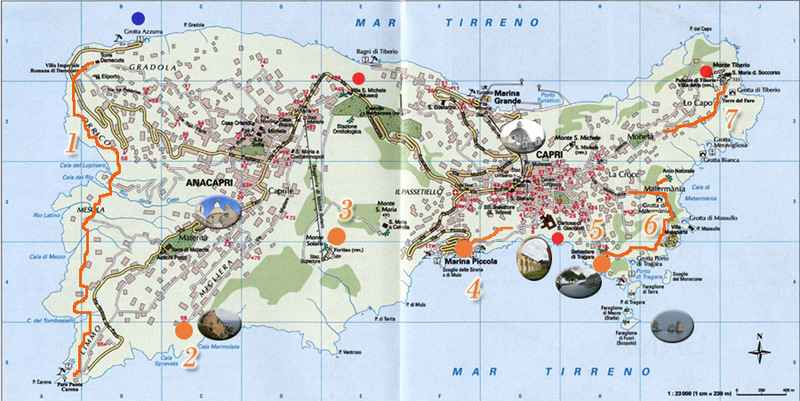 They are emblematic of the island, present on many postcards. Each is named distinctly; the first, attached to the coast is the Faraglione di Terra, 109 meters high; the second, Faraglione di Mezzo, is 81 meters high and crossed by an archway that can be passed by boat; the third is the Faraglione di Fuori, 104 meters high. Where to swim in Capri between private beaches and public beaches? The path of Migliera is a very beautiful walk, easy, quite short and uncrowded, which leaves from Anacapri, crosses local cultures, vineyards, trees, beautiful gardens, to end at Belvedere del Tuono, one of the most beautiful views of the island of Capri. It is from the foot of Monte Solaro, on the right of Piazza Vittoria, that one take this flat road, passing Via Caposcuro, and then Via Migliera. Villa Damecuta is one of twelve Roman imperial villas built by the Emperor Tiberius on the island of Capri. The Via dei Fortini is a path that crosses the western coast of the island of Capri through four forts (Fortini). It crosses very beautiful sites of the coast, cliffs, promontories and small creeks, connecting the Blue Grotto (Grotta azzurra) to the lighthouse of the Punta carena (faro della Punta carena). It takes about 3 hours to complete it. The path is marked with points of red paint. The forts were built between the ninth and fifteenth centuries to monitor the coast, regularly attacked by pirates (including Saracen pirates). 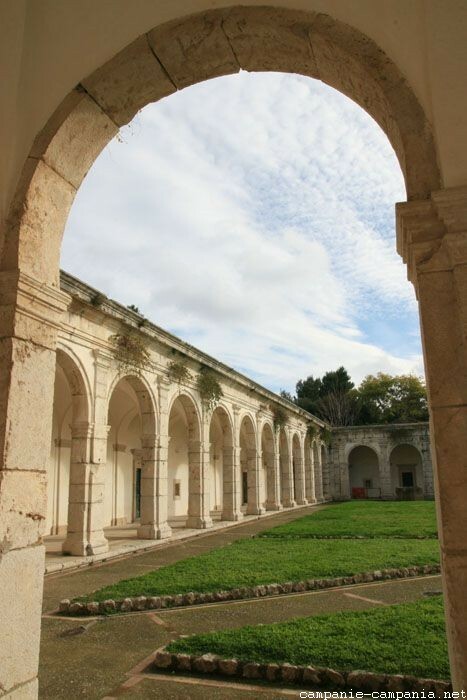 The San Giacomo Charterhouse (Saint James) is the oldest monastery in Capri, built in 1371 by Count Giacomo Arcucci, secretary of the Queen of Naples Joan of Anjou. It houses a museum dedicated to the German painter Karl Diefenbach.